Still making my way through leftover steak, it’s really good! Had some coffee with my lunch too. Add steak, egg, and kelp noodles (if using) to a bowl. Mix in mayo, feta, salt, pepper, and seasonings. Combine lettuce with steak mixture. Top salad with liquid coconut oil. 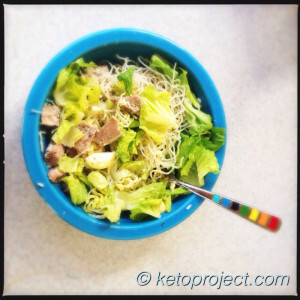 This entry was posted in Lunch and tagged atkins, egg, keto, lowcarb, lunch, meat, salad, steak. Bookmark the permalink.